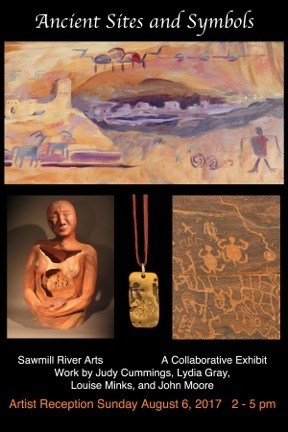 This collaborative exhibit features artwork inspired by the Ancient Southwest! Photography by Judy Cummings; Paintings by Louise Minks; Jewelry by John Moore; Ceramic Sculpture by Lydia Grey. Exhibited at Sawmill River Arts Gallery from Aug. 2 – Sept. 4. Opening reception Aug. 6 from 2-5 p.m. Please join us!